Ben Slater in his Derbyshire kit this summer. With the tantalising prospect of packed houses at Trent Bridge – and bragging rights at stake against former teammates – Ben Slater is determined to play T20 cricket in 2019. The 27-year-old batsman, who signed for Nottinghamshire in August, has a 50-over record to die for and over 4,000 First-Class runs in the bank – yet his career with Derbyshire yielded only seven T20 appearances. 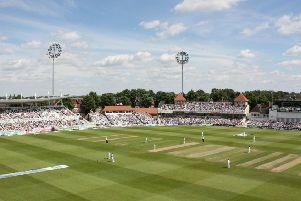 But after the recently released 2019 fixtures threw up a Friday night local derby clash at Trent Bridge against his former county, Slater is more determined than ever to make an impact in the shortest format. “Everyone wants to play all formats, and I’m no different,” he said. “I haven’t played much T20 so far in my career, but I’m working hard on my skills this winter and I want to push for a place in that side as well. “I’ve been in the Derbyshire squad for matches at Trent Bridge before and the atmosphere is brilliant. “Forest versus Derby is a big rivalry in football, and some of that rivalry carries over to cricket in the summer. “There’s an edge to those games. Both sides want to win to get the bragging rights. Slater had to wait for the opportunity to make an impact in 50-over cricket too. Derbyshire overlooked him in both white-ball formats for two whole seasons in 2014 and 2015. When he was selected, against Durham the following June, the left-hander instantly set the record straight with a century. Three more have followed. So too have six half-centuries. Slater now averages 52 over 32 matches in the format. People have earned England selection for less. “Early in my career I was always seen as a red-ball player,” he said. “I never really got a chance in the 50-over game. “For two seasons I travelled around the country, I was in every 50-over squad but didn’t play - and by the back end I was sick of it. “The following year I got a chance because of an injury and scored a hundred. “I took confidence from that and have carried on with the same method all the way through. “The white ball doesn’t do a lot, so the top of the order is a good place to bat. Having joined Nottinghamshire for the final month of the 2018 season, Slater has only – to date – played red ball cricket for his adopted county. A century in his second appearance, against Yorkshire, was quite the way to make an impression. “Coming into a new side, you want to prove yourself as quickly as possible,” he said. “It’s not that I was put under any pressure to do so, but as a professional sportsman you put pressure on yourself. “I was a bit nervous before going out to bat – and when Kraigg (Brathwaite) and I got out there it was nipping all over the shop. 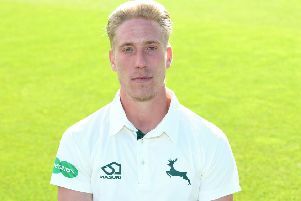 With the rollercoaster ride of being thrust hastily into first division action, Slater – by his own admission – had little time during the season for his move to Nottinghamshire to resonate. Now reporting to the historic venue for work each day, the enormity of the move is starting to hit home. “When I first came it was all a bit surreal. Coming in the way I did, on loan, some things passed me by,” said Slater. “Now, as I come in every day for training, it sinks in that I play at Trent Bridge. It’s a special place.